Atlanta, GA—May 20, 2018—When they walked off the field one week ago victorious over the Colorado Rapids, the New York Red Bulls already knew they had a challenge awaiting them. Their next opponent would be the top team in the Eastern Conference Atlanta United, sporting the top goal scorer in Major League Soccer Josef Martinez, and one of the most dangerous catalysts in the league in Miguel Almiron. Add to that going into the cauldron that is Mercedes-Benz Stadium which has become one of the loudest in MLS and the thought of getting any points would be a formidable task. On Friday, the task got even harder. For the previous 183 regular season matches there had been one constant in the Red Bulls lineup, MLS “ironman”, captain Luis Robles. But the Red Bulls goalkeeper would be on the shelf with a minor knee injury, replaced by long time backup Ryan Meara, who had not started for the red side of New York in the regular season since 2012. And with that, what was to be an already difficult task, seemed to become nearly impossible. Apparently the only group that did not know this were the players and coaches themselves as the Red Bulls won their fourth straight game 3-1 in Atlanta. The Red Bulls still looked very comfortable in the early going doing what they have done all year to opponents, constantly putting Atlanta under pressure with their high pressure. Atlanta countered with their own patented offensive style, sending longer passes over the top to their playmakers of Almiron and Martinez. However, neither team really got any quality chances on goal in what became a war in the midfield that would continue all 90 minutes. The first shot for New York came in the 12th minute when midfielder Daniel Royer fired a volley that needed to be parried away by Atlanta keeper Brad Guzan. The first test for Ryan Meara came in the 21st minute when the Paraguayan Almiron fired a shot that was brilliantly saved by Meara diving to his right. Meara would answer the bell again just two minutes later when he robbed Atlanta’s other superstar Josef Martinez on a breakaway. However, Atlanta would finally break through in the 26th minute when Atlanta’s young phenom Ezequiel Barco latched onto a deflected shot which got past Meara low to his left. Atlanta then smelled blood in the water and appeared to double the lead in the 32nd minute when Josef Martinez beat Tim Parker and then Ryan Meara but the celebration was cut short when the goal was called off for a foul by Martinez prior to the goal. The visitors would then get the benefit of a call from referee Chris Penso when striker Bradley Wright-Phillips drew a penalty when he was dragged down inside the penalty area, and Royer stepped up and chipped the PK past Guzan for his 3rd goal of the season to send the Red Bulls and Atlanta into the locker room tied 1-1 after 45 minutes. Just two minutes into the second half the Red Bulls would get a bad break because of VAR when a straight red card to Atlanta’s Jeff Larentowicz was overturned to just a yellow card after the review. 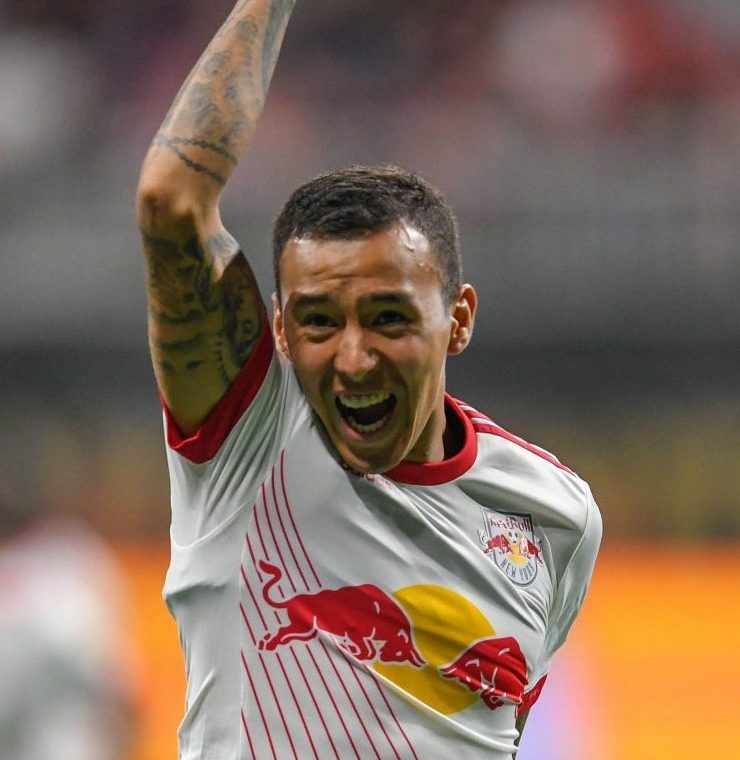 But the Red Bull momentum would continue when right back Michael Murillo sent a sizzling cross in from the right to the penalty spot where Wright-Phillips sent a thunderous header to the far post to give the Red Bulls the lead. BWP would add another goal with his head in the 55th minute when Kaku sent in a cross from the left off an Atlanta turnover which came down off the crossbar and into the net, stunning Brad Guzan and the home crowd of 45,089 into silence. New York nearly added a forth when Royer attempted a bicycle kick off a cross by Tyler Adams but put his shot just wide. By the 64th minute Atlanta manager Tata Martino had seen enough bringing on attackers Kevin Kratz and Hector Villalba to attempt to change the game back into the home side’s favor. But the changes seemed to have almost no effect as the Red Bulls continued to attack nearly scoring a couple more times in the minutes following Wright-Phillips’ second goal. The momentum continued to go the way of the visitors when Atlanta defender Greg Garza was shown a straight red card for a high challenge on Sean Davis putting Atlanta down to 10 minutes. All joyous thoughts of three points would be checked in the 74th minute when defender Kemar Lawrence attempted a diving header clearance at the top of the box and stayed down for several minutes before eventually being carted off on a stretcher with his neck immobilized. X-rays and tests on the Jamaican international all came back negative that evening and Lawrence was released from the hospital. At the same time Tyler Adams came off the field with what appeared to be a right knee injury which visibly upset the young American star as he was sent to the bench. The injuries forced Jesse Marsch into recovery mode putting in Derrick Etienne Jr. and defender Connor Lade, who was seeing his first action since coming back to a foot injury. By the end of the match both teams clearly had nothing left in the tank as the goals and injuries led to 12 minutes of stoppage time at the end of the second half. Atlanta United were almost given one glimmer of hope when Hector Villalba weaved through the Red Bull back line six minutes into extra time but dragged his shot just wide of Meara’s goal. But that’s all that the home side could manage in extra time before the final whistle sounded to seal New York’s fourth consecutive win. New York’s depth will be tested and Jesse Marsch will have some big decisions to make as the Red Bulls look for their fifth consecutive win next weekend as they host the Philadelphia Union at Red Bull Arena. But in this clash between two of the Eastern Conferences’ best, New York reigned supreme.